It’s always fun to marvel at the biggest and best of anything in life, especially travel. And that includes homes, structures, or RVs. You may have thought you had seen the biggest RVs in the form of diesel pushers or fifth-wheel trailers. You may have also thought you’d seen it all with some of the most expensive RVs in the world. However, is another type of RV that blows them all out of the water, especially when money isn’t an object: toterhomes. Let’s look at toterhomes and everything they offer. We'll look at their qualities as well as their pros and cons to help you to decide if these behemoths work for you and your travels. Toterhomes are unique in the RV world as they take many different qualities from other types of RVs. You can consider toterhomes like motorhomes, fifth wheels, travel trailers, and toy haulers all at the same time. The first dead giveaway of toterhomes is their resemblance to trucks or tractor trailers. In fact, the motorized part of toterhomes is usually built on a modified semi-truck chassis. The tow vehicle looks like a beefed-up class-C motorhome or even a semi-truck. A spacious fifth-wheel trailer will usually be attached to the toterhome’s truck. It can house living and sleeping quarters, cars, motorcycles, and even small planes. Professional race car teams often use toterhomes to haul cars to and from tracks. They also provide living and sleeping quarters for those on the go. A toterhome may also be referred to as a truck sleeper because the truck will often have living and sleeping quarters. Hauling capacity. Toterhomes, like their tractor-trailer cousins, are built for one reason: to haul. Some toterhomes may have full garages in the back of their trailer and can haul many vehicles at one time. If you're hauling a lot of weight and you’re on the road often, the toterhome may be your ideal choice. If you’re looking to RV full-time and have fun doing it, customizing a toterhome to your liking is the way to go. Space. Not all toterhome owners are hauling stock cars across the country. Some enjoy all the space that the toterhome provides. 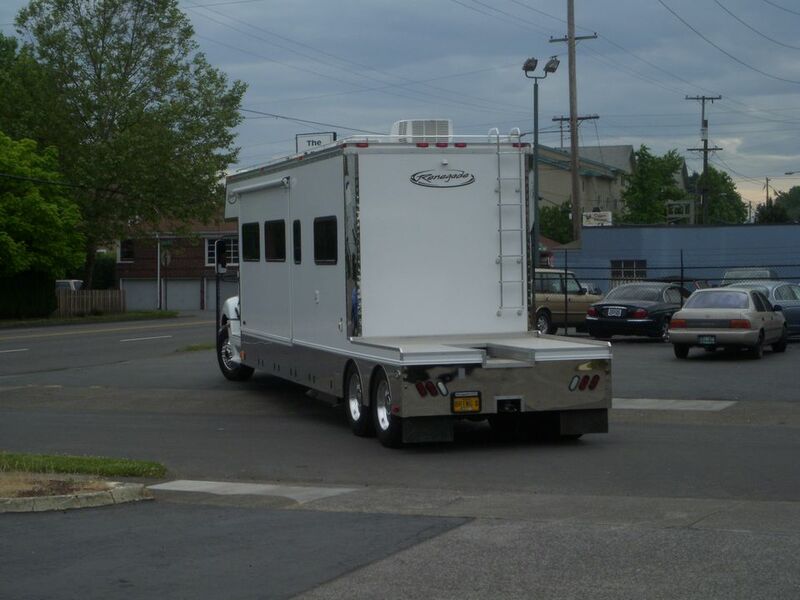 The toterhome's fifth wheel can be large. Imagine the amount of space an empty shipping container has, and you get an idea of what the toterhome can offer. A toterhome could sleep a dozen or more people comfortably, which is why they’re used most often by bands and musicians on tour. Amenities. Don’t think that toterhome owners want the space; they want features, too. You can pack a toterhome with plenty of amenities, such as kitchens, showers, and lounging areas. Toterhomes can be fully customized, have two stories, and include functionality you never thought you’d see in an RV. Just about anything you have in your home, you can have in one of these behemoths. Size. How big is too big? This may be presumptuous, but most RVers out there, even ones with big families, will not need the size of the toterhome. Toterhomes are meant for professional teams such as stock car race teams or mobile workshops. Even a large family will often be much better off at getting a stacked diesel pusher. These monsters aren’t as easy to drive as a class-C motorhome, and the size and weight can make merging into traffic and backing in a hassle. Price. With all that space and power, toterhomes don’t come cheap. You are buying a fifth-wheel trailer and a semitruck, which can eclipse six figures with ease and can even push seven figures. The toterhome may only be available for those with deep pockets. They are easily the most expensive RVs on the market and are often completely customized, such as the types you see musicians and celebrities travel in. All in all, the toterhome is perfect for the type of person or team that needs it but may be impractical for those who don’t. If you want the biggest and most functional RV on the road and have the money to spend, the toterhome may be a consideration for you.